Seems like many of us are interested in a pre-workout awesome supplement when getting fit, losing weight, and making the most of our workout. But do you ever think about your post workout? I know I don’t. I’ve never thought about it once – except to breathe a sigh of relief and be extremely grateful that my workout is done for the day! Along with eating the right foods at the right time, taking the right supplements can help aid in your weight loss and weight training too! Anabolic Unwind from Nutra Innovations is a natural muscle recovery helps your muscles recovery post workout. Even Better, it also improves mood, boosts endocrine, relaxes the mind and body! The best part is, when taken in higher doses, it works wonderfully as a natural sleep aid! I got to try it out over the last few days and have had a great experience using it. I find it helps me unwind after my day, and I feel my mind and body both relaxing in unison. I take it before bed since I normally workout in the evenings, and have found it to be a really great sleep aid. Within a half hour of popping 3-4 capsules, I’m quickly drifting off to sleep! I love knowing that this awesome supplement is aiding my muscle recovery while I sleep too, so I can wake to less sore muscles, and good energy to start my day! If you want to get the post recovery benefits but aren’t ready to nod off anytime soon, you just need to take 1-2 capsules to get the relaxing, muscle and mood boosting perks of this awesome supplement! Get your sleep! Relaxation is important to help the muscles recover quickly, so be sure you’re getting your zzz’s and plenty of them after regular workouts! That pre and post workout food I talked about earlier? Yep, it will help aid in muscle recovery too so be sure get in your carbs and protein! I love a quick vegan protein shake before and/or after my workout for a quick vegetarian-friendly protein fix. Drink up! Staying hydrated and drinking lots of water during your workout as well as before and after can help your muscles recover faster, leaving you feeling less sore the next day! Stretch! Make sure you’re stretching for 5 minutes before and after each workout. I love to incorporate Yoga on Fridays to get in tons of good stretching after a grueling week of working out! Ice those muscles, use those sore muscle creams and pop some Aspirin. Each and all of these are great at helping relieve soreness. Get a Massage – My personal favorite. I’ll take any excuse I can get for one of these, but the truth is they are great for helping relieve sore muscles faster than just letting them heal on their own. 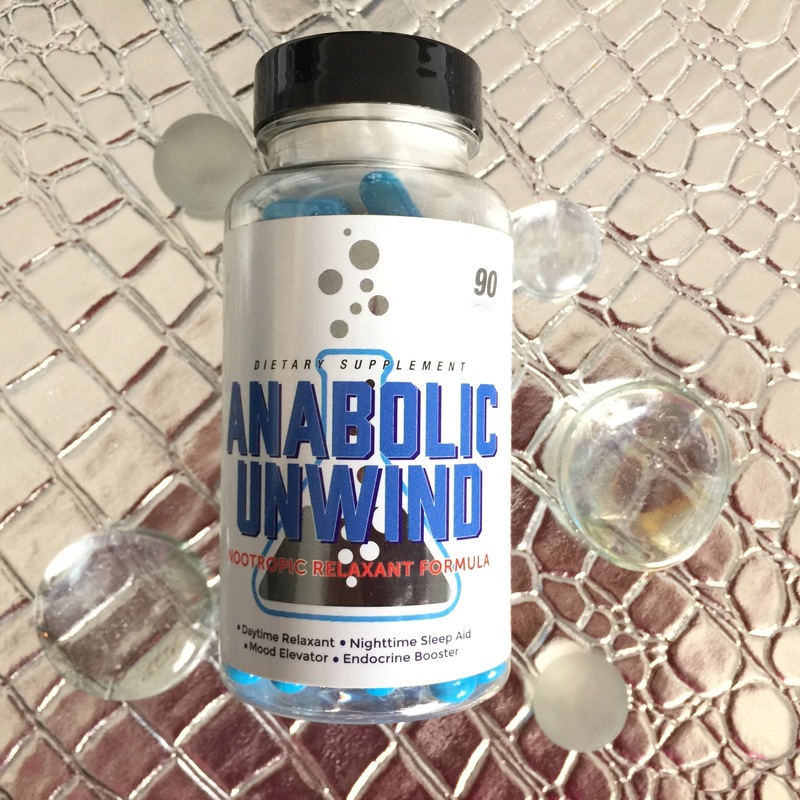 Take a capsule of Anabolic Unwind to relax, unwind, boost your mood, and help those muscles recover faster! Anabolic Unwind is made with all-natural ingredients – which is important for a lot of people, and it works great for both men and women! It also works great for those who are just looking for an anti-anxiety and/or sleep aid (you don’t necessarily have to workout in order to benefit from the product). Along with helping you unwind, build muscle, and recover more quickly, Anabolic Unwind will also help improve your mood! It is designed to increase Dopamine and GABA which in turn makes you feel better, happier, and gives a better overall sense of wellbeing. You will also find tryptophan in Anabolic Unwind which is a natural ingredient known for relaxation and inducing sleep. I’ve loved using my Anabolic Unwind to help aid in muscle recovery, improve my mood, and to help me fall asleep faster and sleep better. My mind and body have been feeling great and my muscles seem to not be as sore for as long either!